Are you looking to spend quality time outdoors? Does your family enjoy adventure? Are you simply looking to take a break from everyday stress? Then you belong rafting the American River with American Whitewater Expeditions. For over 40 years, American Whitewater Expeditions has been the leader in rafting in the region. With expert guides, a passionate staff, amazing equipment, and beautiful campgrounds, we are a “must visit” for your vacation list. The good news is, we are much closer to Nevada than you think! Ready to raft? Check out the whitewater adventures American Whitewater has to offer! Our guides are great, and we believe that you will think so, too. At American Whitewater Expeditions, we only hire the best. All our guides go through a rigorous guide school, and they are all certified, at a minimum, in CPR, First Aid, and Swiftwater Rescue. Besides their top safety skills, our guides are also fun. We are frequently complimented on the amazing personalities that our guides possess and the unique element it brings to the rafting trips. Since the 1970’s we have had superior safety. Not only do our guides ensure a safe trip, but our state-of-the-art rafts, and quality equipment, make the trips amazing and safe, too. In addition to top quality rafts, all our PFD’s are Coast Guard Certified, and the provided wetsuits are of the highest quality to ensure a warm trip throughout the rafting experience. Though our guides are great, we also have great customers. Throughout the years, we have had over 250,000 people choose to raft with us. We welcome all levels of experience, and we guarantee that your trip will be exciting regardless of whether you are new to rafting or you are experienced. We are able to accommodate groups from as far away as Reno and Las Vegas. American Whitewater Expeditions knows how teams work, and we also understand that team bonding is an important part of any successful team. We welcome any teams, or groups, you may have. For our Military, Police, Fire and EMS personnel, we offer discounted rates for you and your family. We are grateful for the safety you provide us! We also would love having your family stay with us! What better way to create family memories then rafting on the American River in the beautiful California sun? With a variety of overnight packages, we are sure to meet any needs you may have. We also have in-ground pools located on our campground that add a fun element for the whole family! If you are looking for extreme fun, a great adventure, and to create lifelong memories, then give us a call today! 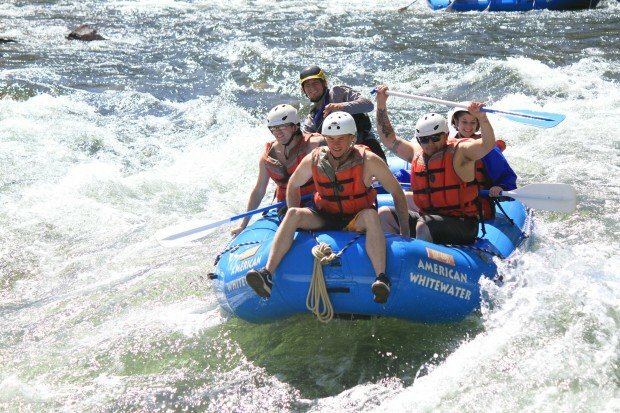 American Whitewater Expeditions has you covered for all your team, family, and individual whitewater rafting needs. Come out and see what you have been missing! Whether you live in Nevada or are there on vacation, your summer isn’t complete without a whitewater rafting adventure on the American River. Browse all available trips and book online, or give us a call to get started today!